UTEP has a long football history, starting in 1914. Sadly, though, the only success the program had was a conference championship in 1956. 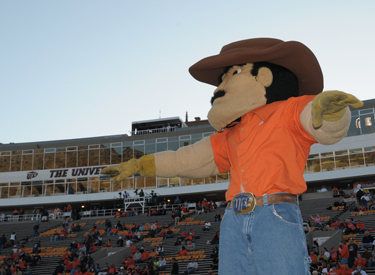 The history of UTEP’s mascot was more bumpy. The first appearance of a mascot was before 1966 when a prospector led a burro onto the filed. The first burro’s name was Dynamite. The other successors were Jenny, Clyde, and Henry. Around that time the school president, Dr. Joseph Ray, got tired of a weak live animal as a mascot. 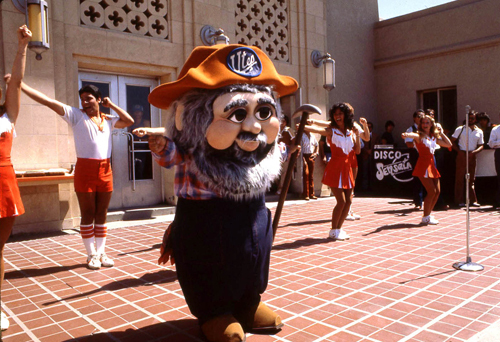 It took until 1974 to rouse up a contest and pick Paydirt Pete as the official mascot. There was a couple of different version of Paydirt Pete that led up to the current Pete, who made his debut in 2004. Let’s check out Paydirt Pete. Like with any other mascot, the huge noggin’ kicks of the costume. You know, for a mascot, Paydirt Pete’s face is very unassuming. It’s kind of bland. And it kinda looks like Freddie Mercury. The hat keeps Pete’s hair in place. For mascots that are cartoon humans, using jeans and boots works wonders. You don’t need football pants or some muscle suit down below. Just a nice pair of jeans. 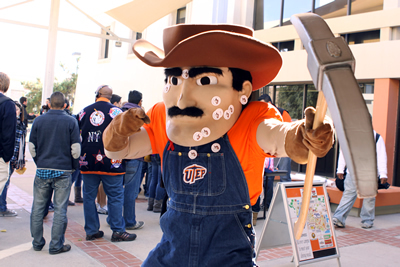 Because Paydirt Pete is a UTEP Miner, he’s got himself a pair of gloves and a giant pick axe. The pick axe is my favorite part of Paydirt Pete. Like his head, the pick axe is cartoonishly huge. I’ve seen other human-like mascots sport accessories from swords, spears, chains, and what have you. It didn’t dawn on me until this profile that the accessories should be just as outrageous as some of the human-like features. What better tool to do it with than a pick axe. Take a look at that thing. I’m sure that Pete can knock out a wall a-la Kool Aid Man with one fell swoop of that thing. More mascots need to take a cue from Paydirt Pete and go big with their tools. All in all, Paydirt Pete is an average mascot. He did get some press for being a finalist in the Capital One Mascot of the Year last year, but I think that’s more due to the pick axe than anything else. Paydirt Pete can dig deep into mines with that huge tool of his. 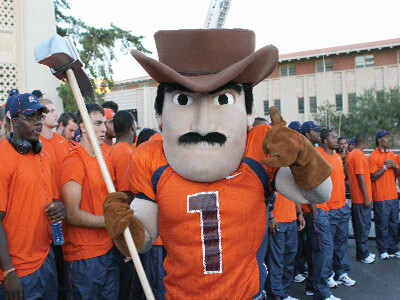 No, I’m not making another Freddie Mercury comparison, but I am speaking about the clean representation of UTEP’s Miner moniker. Although after I get done here, I’ll be spending some time going over my Queen collection again. Scaramouche, Scaramouche, will you do the Fandango?